From a distance, most of the Saturnian moon Dione resembles a bland cueball. Thanks to close-up images of a 500-mile-long (800-kilometer-long) mountain on the moon from NASA's Cassini spacecraft, scientists have found more evidence for the idea that Dione was likely active in the past. It could still be active now. "A picture is emerging that suggests Dione could be a fossil of the wondrous activity Cassini discovered spraying from Saturn's geyser moon Enceladus or perhaps a weaker copycat Enceladus," said Bonnie Buratti of NASA's Jet Propulsion Laboratory in Pasadena, Calif., who leads the Cassini science team that studies icy satellites. "There may turn out to be many more active worlds with water out there than we previously thought." Other bodies in the solar system thought to have a subsurface ocean - including Saturn's moons Enceladus and Titan and Jupiter's moon Europa - are among the most geologically active worlds in our solar system. They have been intriguing targets for geologists and scientists looking for the building blocks of life elsewhere in the solar system. 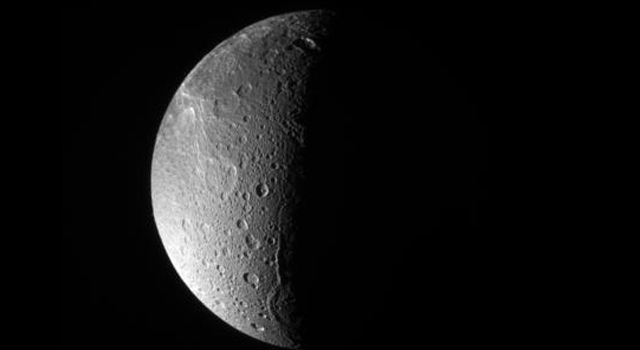 The presence of a subsurface ocean at Dione would boost the astrobiological potential of this once-boring iceball. Hints of Dione's activity have recently come from Cassini, which has been exploring the Saturn system since 2004. The spacecraft's magnetometer has detected a faint particle stream coming from the moon, and images showed evidence for a possible liquid or slushy layer under its rock-hard ice crust. 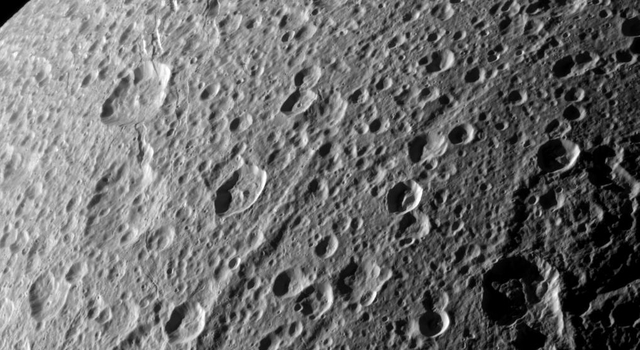 Other Cassini images have also revealed ancient, inactive fractures at Dione similar to those seen at Enceladus that currently spray water ice and organic particles. The mountain examined in the latest paper -- published in March in the journal Icarus -- is called Janiculum Dorsa and ranges in height from about 0.6 to 1.2 miles (1 to 2 kilometers). The moon's crust appears to pucker under this mountain as much as about 0.3 mile (0.5 kilometer). 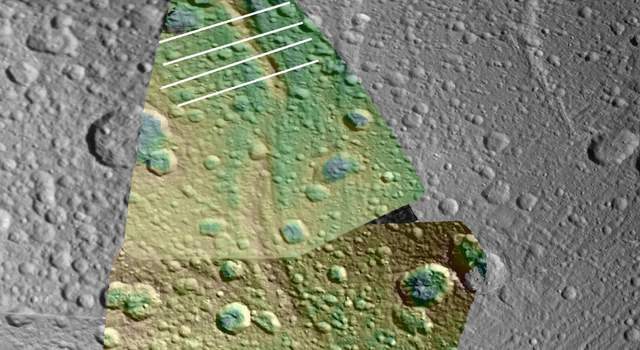 "The bending of the crust under Janiculum Dorsa suggests the icy crust was warm, and the best way to get that heat is if Dione had a subsurface ocean when the ridge formed," said Noah Hammond, the paper's lead author, who is based at Brown University, Providence, R.I.
Dione gets heated up by being stretched and squeezed as it gets closer to and farther from Saturn in its orbit. With an icy crust that can slide around independently of the moon's core, the gravitational pulls of Saturn get exaggerated and create 10 times more heat, Hammond explained. Other possible explanations, such as a local hotspot or a wild orbit, seemed unlikely. Scientists are still trying to figure out why Enceladus became so active while Dione just seems to have sputtered along. Perhaps the tidal forces were stronger on Enceladus, or maybe the larger fraction of rock in the core of Enceladus provided more radioactive heating from heavy elements. In any case, liquid subsurface oceans seem to be common on these once-boring icy satellites, fueling the hope that other icy worlds soon to be explored - like the dwarf planets Ceres and Pluto - could have oceans underneath their crusts. 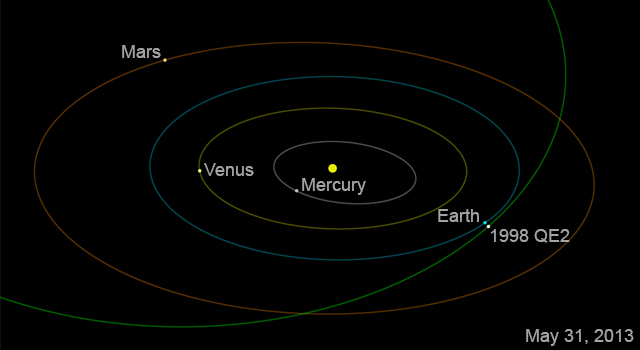 NASA's Dawn and New Horizons missions reach those dwarf planets in 2015. The Cassini-Huygens mission is a cooperative project of NASA, the European Space Agency and the Italian Space Agency. NASA's Jet Propulsion Laboratory, Pasadena, Calif., a division of the California Institute of Technology, Pasadena, manages the Cassini-Huygens mission for NASA's Science Mission Directorate in Washington. JPL designed, developed and assembled the Cassini orbiter and its two onboard cameras. The imaging team consists of scientists from the United States, England, France and Germany. 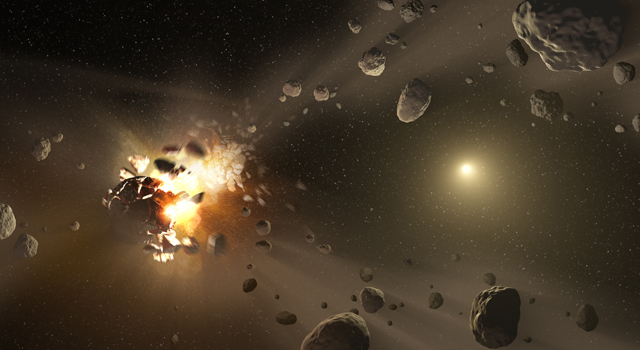 The imaging operations center is based at the Space Science Institute in Boulder, Colo.
Hammond's work was funded through a NASA Outer Planets Research grant. For more information about Cassini, visit: http://www.nasa.gov/cassini and http://saturn.jpl.nasa.gov .